I've been toying with the idea of making my own granola for a while now. It just seems so....me. What could possibly be more exhilarating than taking an ubiquitous grocery item and health-ifying it (i.e. cutting fat and sugar and experimenting with some wacky tastes)? I had a little time on my hand this past week, so I decided to give it a go. I'll start off by saying that granola, while incredibly delicious, usually doesn't make it into my breakfast rotation. I'm an oatmeal kind of gal, and although some people get a little grossed out by the whole hot and runny porridge thing, I lap it up. Literally. The runnier and porridgier the better. But back to granola. The truth about it is that granola, though loaded with healthy stuff (oats, flax, nuts, fruit) is usually also loaded with sugar and fat (that's why it's so delicious!). I'm not on a fat-free sugar-free granola crusade, but when I eat it, I would like to know what - and in what proportions - goes into it. Hence homemade granola. I've found over the past few days that granola can be a bit frustrating. Let me give you a quick rundown of the granola making process: Mix dry ingredients (grains, nuts, seeds), mix wet ingredients (sugar, syrup, fat, fruit puree), and pour wet over dry, moistening everything. Spread mixture on a baking sheet and toast in the oven until dried and crisp. Add dried fruit. Most recipes are pretty standard, and while many leave out the oil and butter or substitute something for it (egg whites, for example), almost all of them still have a lot of sugar. That means I've had to do some experimenting...some rounds of which have been more successful than others. So far I've learned a few things. The first is that it's fun to add a lot of stuff to the dry part of the granola. Instead of doing straight rolled oats, I've been doing a combination of oat, barley, rye, and wheat flakes (sold as a dry mix for hot cereal). I've also been tossing in some Kashi 7 Grain puffed cereal, in addition to wheat bran, wheat germ, almonds, flax seeds, pepitas, and even sesame seeds. I know what you're thinking - I'm crazy. The second is that it takes more than you might think to actually make granola with flavor. In other words, granola is loaded with sugar for a reason: crunchy-toasted rolled oat flakes are a bit, well, bland on their own. 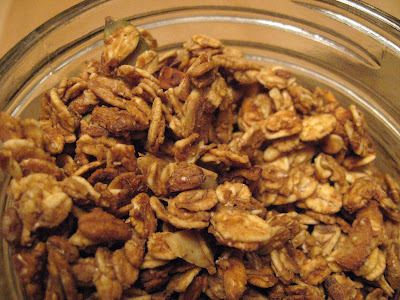 This is where my main challenge lies: coming up with a good recipe that yields flavorful, if not too sweet, granola. The first batch I made was based on this recipe, which calls for applesauce as a fat substitute and flavor-enhancer. I added pepitas, almonds, and sesame, which worked quite well. I also sprinkled a lot of cinnamon and ground ginger on this batch - I've discovered that spices and extracts (vanilla, almond) are essential for a flavorful granola. 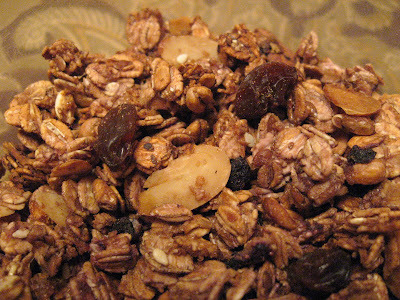 This batch was tasty, but the flavors were pretty standard, and I wanted to expand my granola horizons. The next batch was blueberry-ish: I used some blueberry-pomegranate juice as the base for the syrup, and tossed in a few frozen blueberries, as well. This batch, sadly, was mostly flavorless - not nearly enough sugar, although a hefty sprinkling of cinnamon and cardamom salvaged it mid-way through baking. 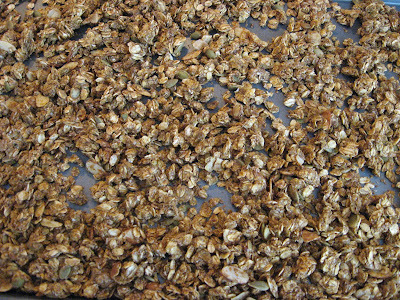 Ok, so the experimentation continues...I haven't hit the granola jackpot yet, but I sure am trying. I did make a rather tasty creation today: peanut butter-banana granola, which gets its sweet-salty flavor from the peanut butter. I still have a few more ideas in mind, so bear with me as I search for the perfect recipe to share...wish me luck, and try to keep in mind the quantity of mediocre granola I've been consuming in an effort get to the bottom of this culinary challenge. I just received it yesterday...delicious!